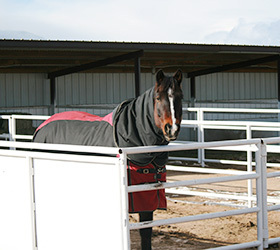 A Painted View Ranch offers horse care services for boarders and guests. Our state-of-the-art facilities are available to rent for competitions & events. The 160-acre ranch located in Westcliffe, Colorado offers many different choices to accommodate your horse's full care and special needs. 15 ft. x 15 ft. stalls in a heated barn with turn-outs into lush grass. Individual 3-sided metal turn out sheds with plenty of room to exercise in a 16' x 48' run. Steel pipe fencing, a safer choice for a frisky horse. If you are interested in boarding or would like to request more information, please call: 719.783.9100 or email: rdh@apaintedview.com. 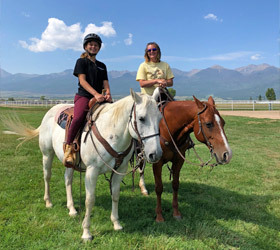 If you are interested in horse training, lessons, or would like to receive more information, please call: 719.783.9100 or email: rdh@apaintedview.com. Homegrown mixed-grass hay (Timothy, Brome, & Clover) for sale by the bale! 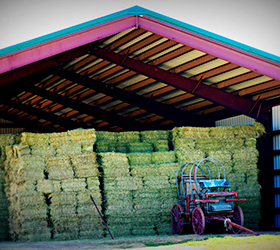 To purchase our hay or to request more information, please call: 719.783.9100 or email: rdh@apaintedview.com.